After teaching for 2 years, I realized that I needed to choose a Masters program that interested me and would further my career. I started understanding that I secretly had a passion for learning and knew that the ever-changing field of technology would feed my appetite. I enrolled in an online course (my first) through Western Michigan University. I took 3-4 classes in their program at which time the program suffered some losses due to a lot of turnover in staff and retirements. I wasn't willing to wait for things to get straightened around so I defected to Michigan State. I am still very pleased with my decisions. In the summer of 2005, I was part of the summer cohort. Nine credits in five weeks and on campus. I LOVED it! And from there, the rest is history. Below you will see a compilation of my coursework during the Masters program. Please feel free to use the comment form on my homepage for any feedback. It's a continual work in progress. Please follow the links below each course name to see a brief description of the course and a project or two that was completed during the course. 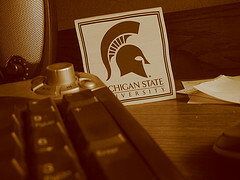 Thanks to nino63004 (via flickr) for the photo used on this page and all MSU Coursework pages linked off of this page.